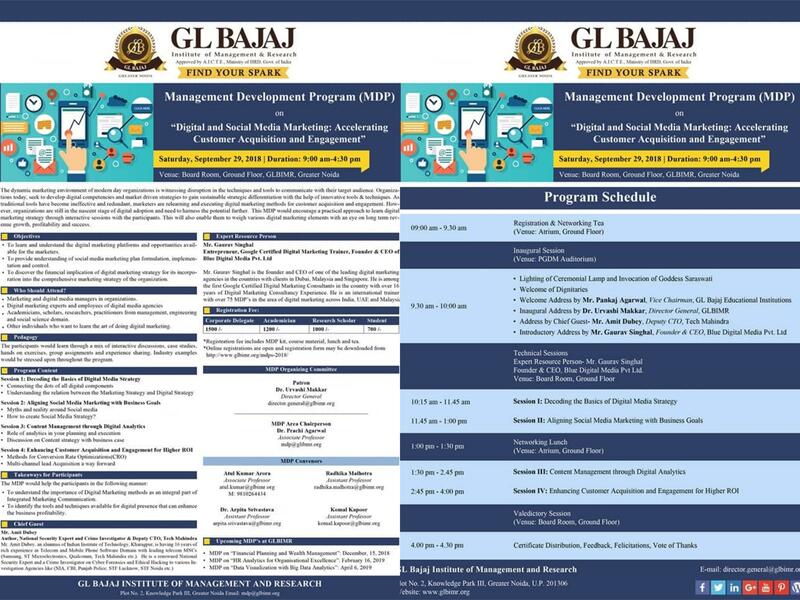 We are proud to announce that GL Bajaj Institute of Management & Research (GLBIMR) is organizing Management Development Program (MDP) on “Digital and Social Media Marketing: Accelerating Customer Acquisition and Engagement” on September 29, 2018. In a constant endeavor to contribute towards the development of Intellectual Capital and to achieve academic excellence, this is yet another remarkable initiative taken under the astute guidance of Dr. Urvashi Makkar, Director General, GLBIMR. This MDP will be facilitated by eminent Industry experts including Mr. Gaurav Singhal, Entrepreneur, Google Certified Digital Marketing Trainer, Founder & CEO of Blue Digital Media Pvt Ltd. and Mr. Amit Dubey, Author, National Security Expert and Crime Investigator & Deputy CTO, Tech Mahindra. This program is designed to gain an understanding of the digital marketing platforms and opportunities available for the marketers and to provide hands-on learning of Social Media Marketing plan formulation, implantation and control. 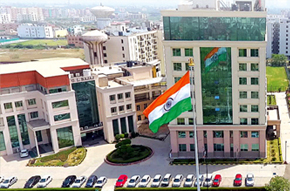 It will provide valuable insight into various constituents of financial implication of the digital marketing strategy for its incorporation into the comprehensive marketing strategy. In this regard, the corporate delegates, academicians, research scholars and students are invited for attending the MDP. For further details visit our websitehttp;//www.glbimr.org/mdps-2018/.